The ingredients for channa masala, including kala channa–black chickpeas. 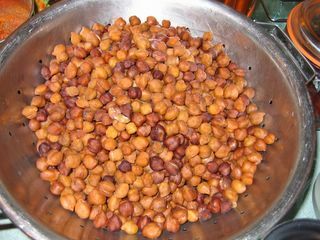 I usually cook this dish with the more common white chickpeas, but all I had in the cupboard was kala channa yesterday. Channa masala is one of my favorite Indian dishes. The version I cook is one I learned from a waiter at an Indian restaurant called Akbar, in Columbia Maryland, which is known for excellent cooking. He wouldn’t tell me what was in their channa masala, but we played a game, where I would guess and if I was right, he would tell me if I was right or not. If I was right often enough, he would give me hints. It was how I learned to refine my ability to discern ingredients in Indian foods; he would bring a dish, let me taste it and then ask me what was in it. After weeks of this, I began to be able to pick out the individual spices that would make up the complex bouquet of any given curry. The channa masala I make, therefore, is based upon Northern Indian cookery principles, since that is the sort of cuisine that was served at Akbar. When we ordered the dish, often our waiter friend would bring us a plate of bhatura to go with it–it is a fried bread that is made to go especially with channa masala (which is also known as channa chaat). There are whole restaurants in Northern India, we were told, which served only bhatura and channa masala. If you ever get a chance to taste them, you can see why–the golden crust of the bread and steaming hot interior is a perfect foil for the tender channa with thier fiery spices. Most of the time, I make my channa masala with regular white chickpeas, but since what I had was kala channa, or black chickpeas, I used them instead, to great effect. The nutty, somewhat firm texture and character of the kala channa went very well with the flavors of the curry, and since I served them not with bhatura, but on a bed of yellow basmati pillau, they mixed very well with the rice, being smaller and more texturally interesting. As you can see, they are smaller and much darker than white chickpeas. They stay firmer when cooked and have a delicious nut-like flavor, too. juice from canned tomatoes or ½ cup tomato juice, if using fresh tomatoes. chopped cilantro and mint for garnish. it is said to help prevent flatulence when cooked with beans). If using canned beans, skip this step. (canned chickpeas are sometimes a bit overly tough. If this is the case, cook them longer after you add them to the spices and water mixture, until tender, adding water as necessary) When I use the pressure cooker, I cook them on high pressure for 18 minutes, then quick-release the pressure, drain them and continue the recipe. 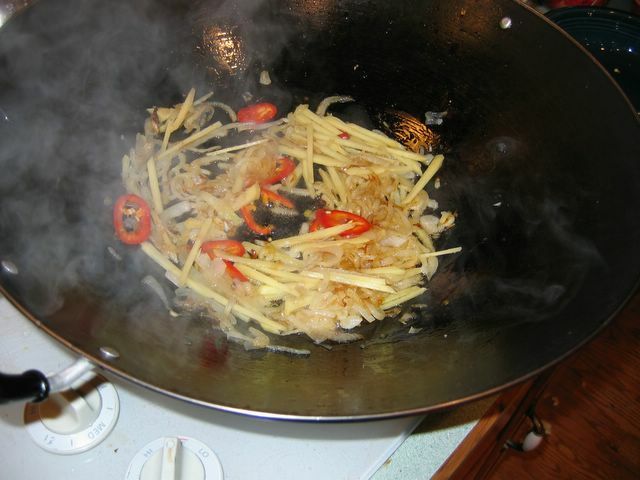 In a large wok, karahi or dutch oven, heat enough vegetable oil to cover bottom. When hot, add onions and cook, stirring until browned and soft. In cooking Indian food, the step of browning the onions is crucial. Most Americans do not brown their onions sufficiently, which results in an insipid onion flavor. Do not stop at this stage–they are not even halfway done. By the time they are cooked, they should be deep reddish brown, and smell sweet. Add ginger slivers and minced ginger, and cook several more minutes. Add garlic and cook until golden, stirring continually. 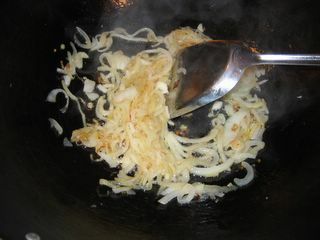 When your onions are a deep golden brown, it is time to add the fresh chile pepper and ginger. I wait until the onions are nearly done–about two shades darker than this–to add the garlic. 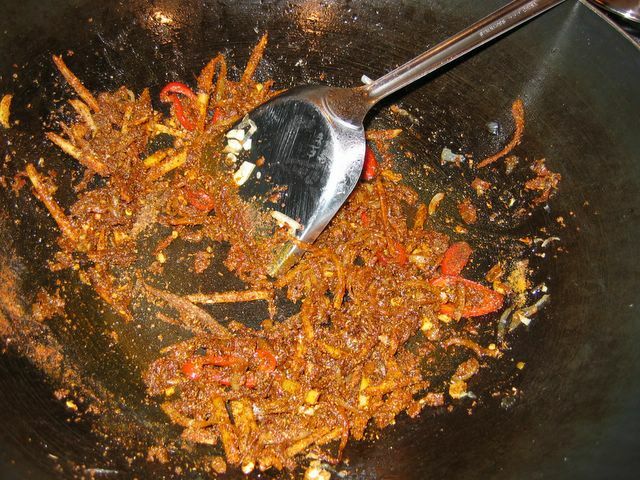 Add spices, and cook, stirring one minute, until very fragrant. Add salt and ½ cup of water, stirring well. The spices go into the pot after the onions are fully browned, and they are mixed in and allowed to cook in the oil for at least two minutes. They become very fragrant and the flavors begin a fruitful marriage. Add drained cooked beans, the broth, the tomatoes with juice and turn the heat down and simmer to reduce by a third. 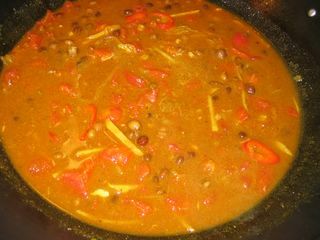 Then, I add the liquid, the tomatoes, and the channa, turn the heat down and let it simmer. I like to use vegetable broth, but water will do. turn to a simmer and cook down into a thickish gravy, about 20 minutes. Here, you can see how much I reduce the liquid by simmering. It thickens on its own, and takes about an hour or so of good simmering. Garnish with chopped cilantro and mint. Here is the finished channa masala, in a bowl over yellow basmati pillau with a garnish of chopped fresh mint and cilantro. The colors are delicious together and the fragrance is redolent of earthy beans, shimmering spices, the tang of ginger and the delicate sweetness of mint. I will post a recipe when we get back from buying a house. We are leaving tomorrow, and coming back Tuesday, so I will post about it Tuesday evening. Well, rather than make an entire post, for something so simple, I will just tell you here, how I make my yellow basmati pillau. I make it fairly plain, especially when it is going with something so spicy as channa masala. I take two cups of basmati rice and rinse it well in a colander. Then, I let it dry. I heat up a frying pan and melt butter in it, and sprinkle in a bit of cinnamon, salt, and a bit of garam masala in it. I saute the rice with a handful of sliced almonds and a half handful of rolden raisins until it is all fragrant and coated with the butter. This entire thing I dump into my rice cooker. Then I take three cups of water and dissolve about a teaspoon of turmeric in it, and pour over the rice in the cooker, stir to get everything mixed and close the cooker and turn it on. And when the little beeper goes off, it is done and I fluff the rice right up. Basmati does. With two cups of jasmine rice in either my rice cooker or in a pot on the stove, I use two cups plus a scant 1/4 cup of water. The measure for basmati that I learned and use is one cup of rice to one and a half cups of water. Just to clarify, the yellow rice gets its color from the turmeric. Reading this article on channa masala was enlightening — to a guy who cooks it every week. Great job, and wonderful pictures. The chana masala I have in the fridge is similar — but now I know I have to add more sauce and reduce it for longer. All in all, I think you’re a wonderful cook and a graceful addition to human knowledge on the internet. Thank you, Ro–it is nice to meet you. 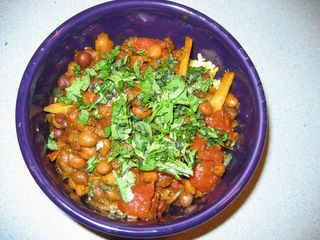 I am continually amazed at how many people have searched out and found my blog by seeking recipes for channa masala. Every week I get at least two hits from people coming to see this post I wrote way back in February! Reducing the sauce adds a great deal more flavor to the dish–this is true in any cuisine–it is a principle I picked up from culinary school, and which I use in nearly anything I cook. I think it is a simple principle that anyone can utilize in order to make their food better. Good afternoon. I was looking for info on buying a house and I found this blog. I am not exactly sure why, perhaps you have the term “Buying a house” on your site somwhere. Anyway, i have read through some of your posts and it is very interesting. I have bookmarked your blog and will return next week to see if there are any updates. WOW! what a wonderful way to prepare chana masala. As always, I love the way you write recipes. Just brilliant Barbara. PS: I am really sorry for the delay in replying to your mail on virtual cooking competition. I will do that soon. Please dont mind. I found your site trying to search for a kala chana recipe. 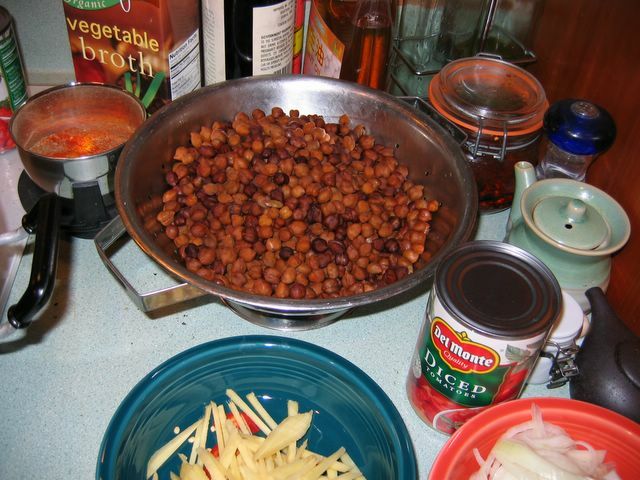 White chickpeas recipe are abound…but I think yours is the only site with pics which show this method of cooking. I am from India,and I admired your post! Welcome, Anwesha! You know, this has been one of the most popular of my posts for Google searches–lots of people are looking for either kabuli channa recipes or channa masala recipes, apparently! I do hope you come back and visit, and I am pleased by your very dear praise. Hello and thank you for this wonderful recipe. I just started my own Personal Chef business and have an Indian client. 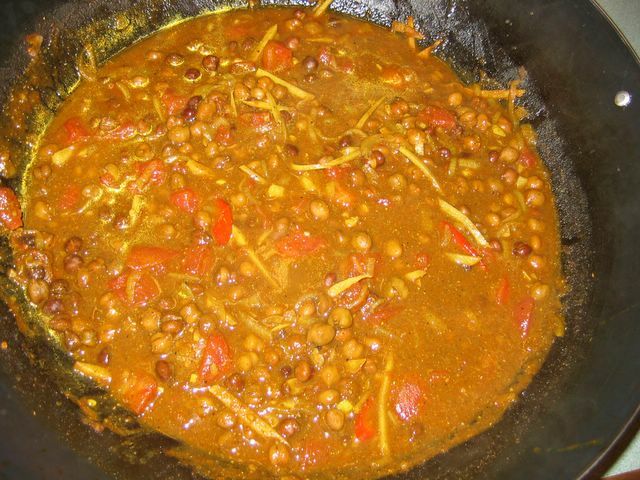 I have been searching the internet for all kinds of interesting recipes and needed one for black channa. So glad that I stumbled across this! I’m excited to try this new recipe for him. Again… many thanks! Hello, GMCFM–if you want more Indian recipes, look on my index and click on the “Recipes–Indian” section. Also, try looking on my blogroll, and check out some of the really great food bloggers from and in India–these ladies and gentlemen can really cook, and they love teaching about their native foods. Their recipes are unfailingly authentic and delicious. Give them a try, too, and if you have any questions, just ask. I used to be a personal chef, too and I especially liked cooking for my Pakistani and Bangladeshi clients as well as my Chinese clients. I loved this kala chana recipe. There are very feew on the net. One thing I did different id that I mashed some chana and added it to the gravy. it gave the apperance of thickness. It will be more useful for people who do not eat Onion & garlic. My mother-in-law is from N India (Punjab) and she has taught me to make most of her family recipes. Let me just concur that timing, patience, and waiting even a bit more is the secret to this delicious dish (and many others)! It is one of our family favorites. Oh, with the basmati, be sure to rinse it 5 times to get rid of the starch. I understand the Punjab are very careful on this…as with their dal. Namaste. Just a follow on to the rice cooking methods… This is my fragrent rice! Place the rice in a large saucepan (which has a well fitting lid) and wash and rinse the rice 6 times or until the rinse water runs clear. This removes excess starches so the rice doesn’t stick together. Soak the rice in cold water for 30 minutes. Drain the rice carefully and then add 1 cup of cold water and all the other ingredients. Now bring the rice rapidly to the boil. Give the rice a quick stir to make sure it not sticking. At this point reduce the heat to very low, place the lid on the pan and leave to just simmer for 20 minutes. Do not under any circumstances remove the lid during this cooking cycle as all the steam will escape and the rice won’t cook properly. After the 20 minutes turn off the heat and leave the rice for a further 5 minutes before removing the lid and picking out the large spices (bay leaves, cardamoms, cloves and cinnamon). Finally fluff the rice up with a fork ready for serving. This is my take on this dish! Place the whole spices (mustard seeds, cardamom seeds, cinnamon and bay leaves) in a saucer and add to those the already ready ground spices (heeng powder, chilli powder, turmeric powder) and the salt. Place the whole spices to be ground (cumin seeds, coriander seeds and black pepper corns) in a coffee grinder, reduce to a finely ground powder and add to the other spices in the saucer. Place a generous amount of oil in the pan on a gentle heat. Add the onions and cook gently till soft. Add the ginger and garlic and continue to sauté until soft and starting to turn slightly golden. Add the spices (except the Methi Leaves) and cook them in for a further 2 to 3 minutes. Add the chickpeas including their stock and stir fry till most of the excess water is driven off. Add the chopped tomatoes, the tomato puree and the tamarind. Cover the pan and very gently simmer for ½ an hour adding a little more water if necessary. At this point you should have a rich sauce so just add the Methi Leaves and simmer for another 5 minutes, remove from the heat and add the chopped coriander leaves.